Blueberry picking time is here again, I do enjoy this season so much! The blueberries are so plentiful this year!! Did someone say Luscious? Blueberry jam is on the agenda for this week! 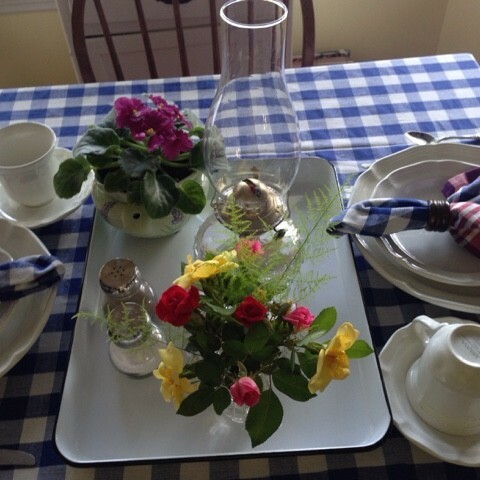 A blue checkered tablecloth set with roses, and violets, and my favorite everyday dishes! A big blue clock, purchased at Hobby Lobby with 66% off! Couldn't resist, "Carolina Blue" don't cha' know!! Blueberry hand pies for dessert, yummy, I would like to soon show you how I make these pies and freeze them for a dessert that is quick, easy and so delicious, especially with unexpected company coming , and when the cold winds blow in winter! These pies are baked not fried! ~smile~Now where's the ice cream? To wipe these dirty blue clogs on! We don't wear shoes inside our home, this has always been a practice from the beginning of our marriage! Love my clogs!!! 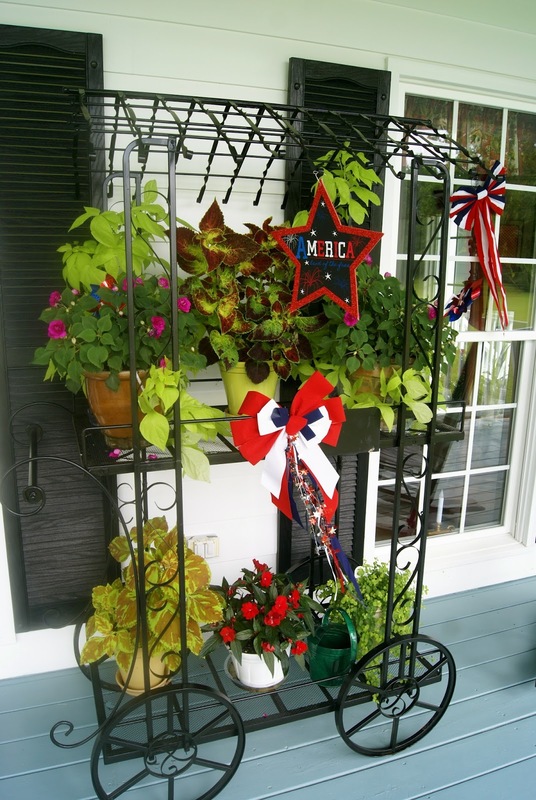 I also worked on hanging the sheers for the porch, I still need to add a few touches, like those patriotic pillows, ~grin~ I know July 4th is this weekend, but I will keep the patriotic porch until the first week in August. While at Hobby Lobby yesterday I noticed the Fall and Christmas decorations were out! WOW!, it seems merchants are rushing the seasons, no wonder we are always rushing around, we are trying to keep up with them! What a shame! Psalm 118~ 24 ~ This is the day the Lord has made; We will rejoice and be glad in it. Last, but not least, though he is not blue, I will share one of God's beautiful creatures, the tree frog, he reside here on my porch,along with many others in his family. I don't like the mess they make,but since they eat a lot of insects, I've decided they can stay! Here he is climbing a wall, so amazing! I am linking with Stephanie at Roses of Inspiration, thank you for hosting Stephanie, as usual I am late for the party, but better late than not at all, so they say.~smile~To all who visited last week and especially those who took the time to comment, "thank you so much". Thats about all from the farmhouse for today, I hope you are having a most blessed day. If you come looking for me early in the morning you will probably find me in the herb garden,first thing on my agenda is going through pulling any weeds that have popped up overnight, trust me they do pop up overnight. ~grin~ Next I clip any over growth I see, especially if the herb is beginning to flower out, that is not good, when this happens the herb losses some of its potency and flavor. As you can see Peter Rabbit is very diligent about keeping an eye on the garden, nothing gets by his watchful eye. #1photo~Here you find, rosemary, love the fragrance so much, it is very strong! I use this with baked chicken,and salmon! #2~going across is sage, I use this in stews, dressing,also dry it for later, though this herb is hardy in the South, and most times I can gather it fresh! 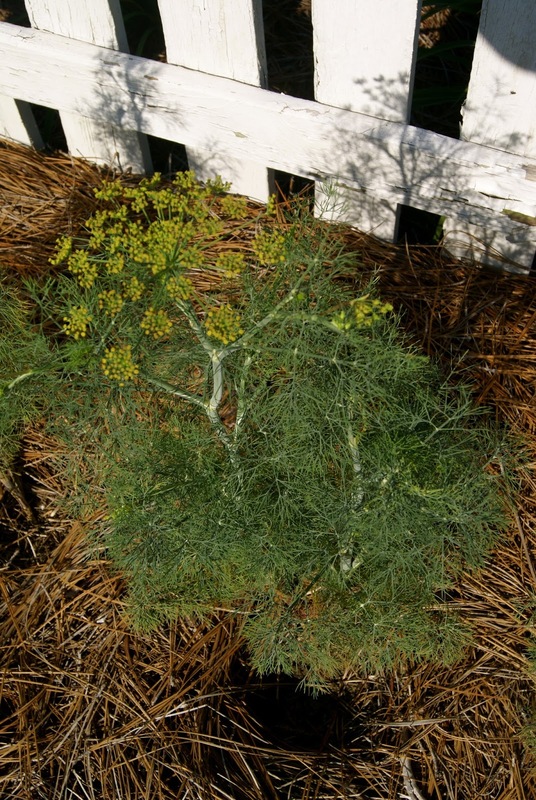 #3~flat leaf parsley, this herb is great for just about anything,also use fresh and dry! #4~curly leaf parsley, same as with the flat leaf parsley, also it is good for freshening the breath, just pick, wash and pop in the mouth! 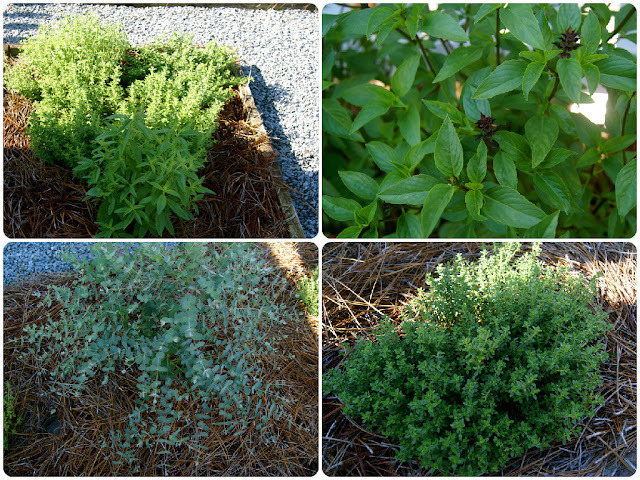 #1~ has several varieties of oregano, there is even a spicy hot one, it is very hot! I use oregano fresh and also dry for winter. This really comes in handy when I make my spaghetti sauce. #2 basil, I have about five different varieties, love the smell of basil! Do you see the flowering bud at the top of the stem, cut it off, the basil plant will become bushier, and the flavor will be stronger. #3~ is eucalyptus, I use it when making flower arrangements, can also be used medicinally. #4~ is lemon thyme, smells so good, I also use it fresh and dry for winter. This is stevia, I will be cutting and making a fresh stevia elixir this week, great for those watching their weight and who like sweets. Lets not forget dill, I use this in making pickles, as you can see the seed are forming, just waiting for them to dry!I also plant garlic chives, good for making vinegars, lemon verbena, curry, marjoram! On my way in from all the heat and humidity I couldn't resist cutting a few hydrangeas for drying! I tried this last year for the fist time and had great success!This has become one of my favorite flowers! Genesis 1:29~ And God said, Behold, I have given you every herb bearing seed, which (is) upon the face of the earth, and every tree, in which(is) the fruit of a tree yielding seed; to you it shall be for meat. 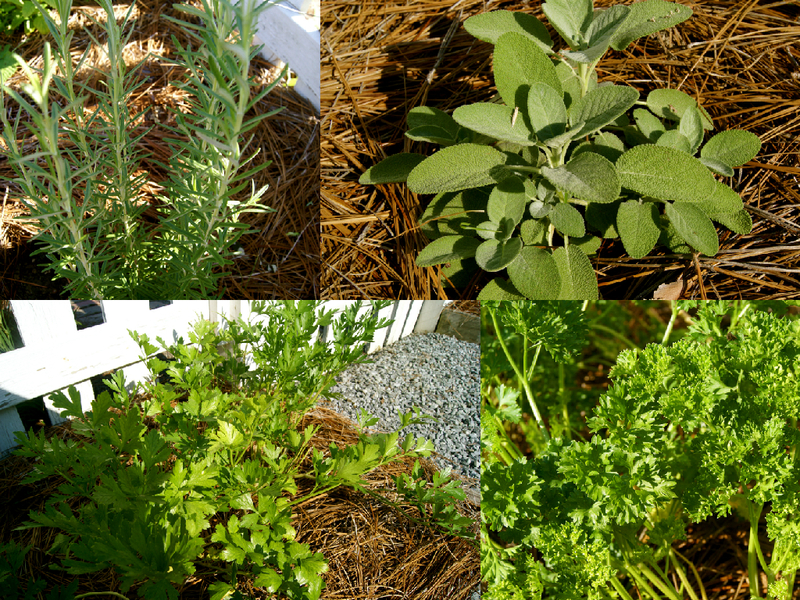 I hope you enjoyed your visit with me in my herb garden today, I started learning and planting herbs over thirty years ago, and truly believe they are so healthy for us, when I use herbs, I don't have to flavor so much with salt, plus I use herbs for medicinal uses. Example.... Last night Mr P. went out to water the plants on the porch, dressed in shorts no T-shirt, the mosquitoes had a feast, he showed me the whelps and bites this morning, I immediately went and made a mixture of coconut oil and Tea Tree oil, rubbed it practically all over him, (I have never seen so many bites), immediately he had relieve and has not had any itching since, though the whelps and bites are still very visible. Tea Tree oil is always in our medicine cabinet! So many other uses for it! That's about all for now from the farmhouse, I would like to really complain about the hot, humid weather we are having, but the Lord wants me to be thankful for what I have, my heart and prayers go out to all those who are having even worse weather situations than a little heat and humidity! As I know that this will soon pass, but those who lost everything in the tornadoes and flooding will have a tougher time rebuilding their lives.Please help me pray or them! Once again linking up with Stephanie at Roses of Inspiration, thank you Stephanie for hosting, I am looking forward to making new friends! 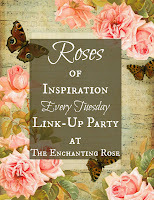 Also thank you for mentioning my blog and welcoming me to Roses of inspiration link-up party! 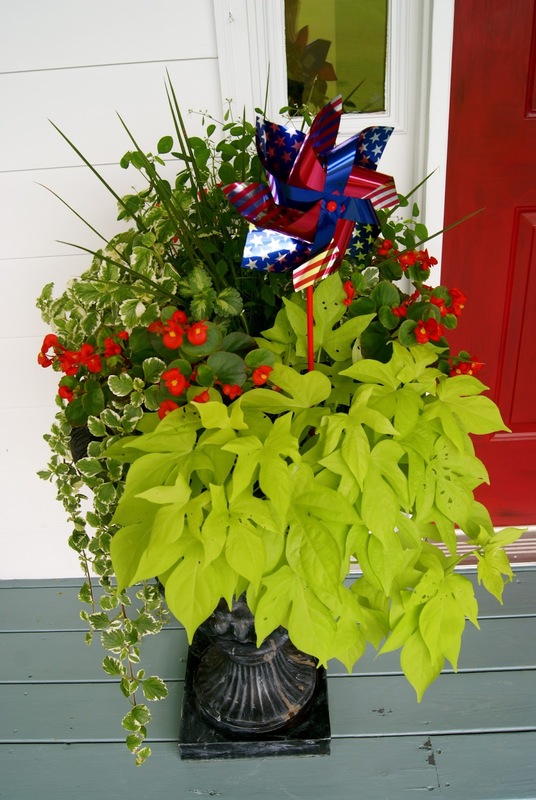 The not quite finished patriotic porch! chocolate chip cookies and some jam.Did you know that Country cookies are not uniformed, just like us, God made each of us unique and special! This is what I have thus far completed, I need to hang the sheers, sew the patriotic pillows, etc. That's about all for now from the farmhouse, stay tuned something is always brewing around here. 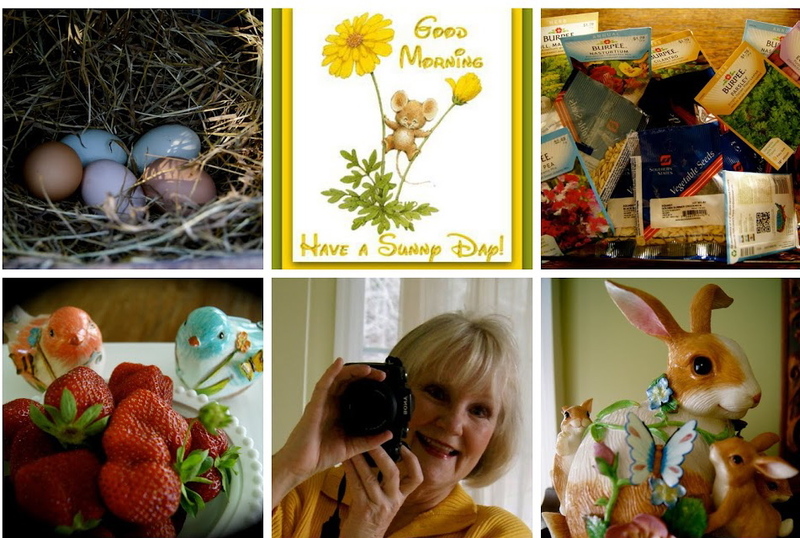 Linking up with Stephanie at Roses of Inspiration, thank you Stephanie for hosting, I am looking forward to making new friends! BTW Do you see that iron in the background? I put it to good use yesterday too, as a matter of fact I worked for quite a few hours straight without a brake, even slept under sheets that were kissed by the sun, soooo. Mr P thought I deserved a day off we are leaving just as soon as I finish this post for our State Farmers Market, "flowers and herbs here I come."